The defroster heats the window to remove frost, fog and thin ice from the rear window, while the engine is running. 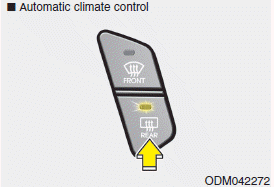 To activate the rear window defroster, press the rear window defroster button located in the center facia switch panel. 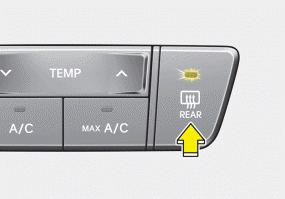 The indicator on the rear window defroster button illuminates when the defroster is ON. If there is heavy accumulation of snow on the rear window, brush it off before operating the rear defroster. The rear window defroster automatically turns off after approximately 20 minutes or when the ignition switch is turned off. To turn off the defroster, press the rear window defroster button again. If your vehicle is equipped with the outside rearview mirror defrosters, they will operate at the same time you turn on the rear window defroster. If your vehicle is equipped with the front wiper deicer, it will be operating at the same time you operate the front windshield defroster.